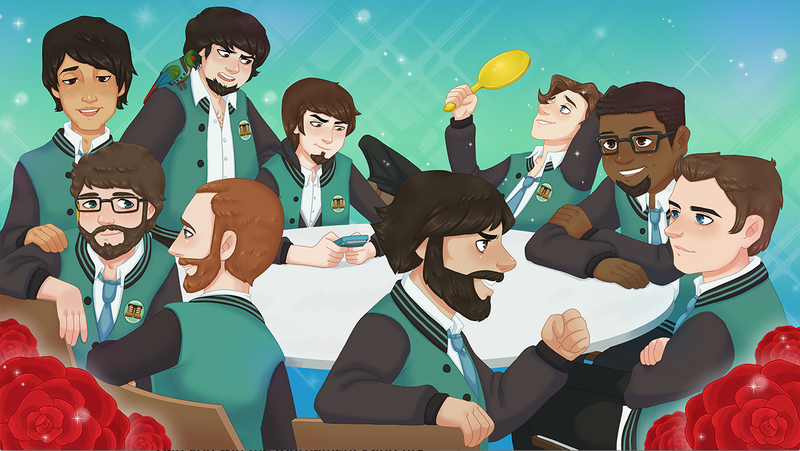 Released on the 21st of April 2016, a game called Asagao Academy has appeared on the Internet that allows you to seduce and date a bunch of your favourite gaming YouTubers. For the unbelievable price of NOTHING AT ALL, you can now date nine of the famous YouTubers from the Normal Boots Club thanks to game developers and your new best friends, Daniella Hargrave and Cara Hillstock. The game was originally planned back in 2014 when Normal Boots (a gaming and pop culture channel) were recovering from a hiatus. In a desperate need to reinspire over 7.5 million subscribers across their network, they were approached by Daniella and Cara with the crazy idea of creating a YouTuber dating simulator based off their most famous club mates. The game got the go ahead and after a very successful KickStarter campaign which raised over $26,000, fans of ProJared and The Completionist can now fulfill their wildest fantasies by making them fall in love and live happily ever after. Asagao Academy is a free PC game available to download right now. In the game, you play a young girl in a new school who befriends a handsome and charismatic group of popular gaming boys - of whom you might just recognise as famous YouTube gamers. Whilst we can't predict the amount of time you may spend playing the game and getting to know all the club mates, there is certainly a mammoth amount of things to unlock with 43 different endings, 16 songs and over 340,000 words some of which are voiced by their IRL YouTuber! Long story short, think a dating simulator but all you can do is talk to bae, nothing else. Most of the action takes place in the dialogue, with the outcome of your dating adventures relying 100% on how well to communicate and socialise with your YouTube fave; say the wrong thing and it could be game over for your OTP. The main aim of the game is to allow you, the player, to get to know some of your favourite YouTubers whilst simultaneously thirsting after your first in-game romance option- but it's much harder than it looks! Asagao Academy allows players to take on the role of Hana; a bubblegum haired girl who transfers to a new school with a strong desire to get into the most popular competitive gaming club there is, The Normal Boots Club. The club features nine guys (of which you can date seven! ), with stereotypical visual novel characters being recurrent throughout - JonTron is the drama geek, Did You Know Gaming is the one that's hard to impress, and so forth. Talking to Kotaku about the reception the game has received since it was released last month, Daniella says that "I honestly didn't know what to expect. I didn't know how many people were going to be able to get over the weirdness that a YouTube dating sim sounds like". Clearly, the strangeness of dating your YouTube faves has paid off because since it's release, it has been downloaded over 58,000 times and the YouTubers featured in the game are starting to upload their cringe-worthy Let's Plays. Asagao Academy took two years to complete so if you're a mega Normal Boots fan (or just really want to date JonTron like me), then the game is 100% worth a play - it's free to download, so what are you going to lose?! You can see the full trailer above or search 'Asagao Academy' into YouTube to watch stars of the game try to seduce themselves!